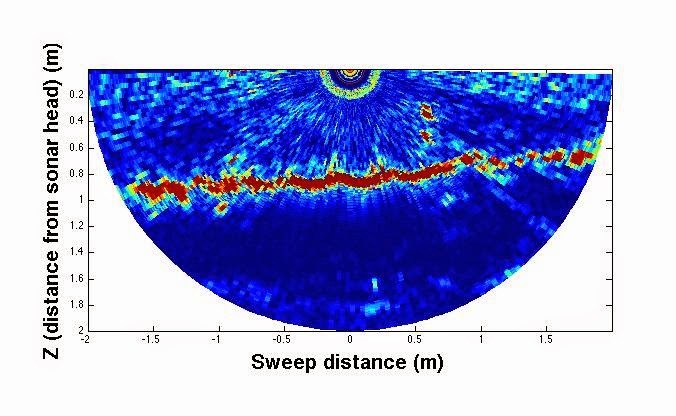 MEGAPEX: Using sonars, a laser and a camera to observe change in RIPPLES! Using sonars, a laser and a camera to observe change in RIPPLES! As a part of the larger TUDelft hydrodynamic array, the University of New Hampshire (United States) is working to measure the temporal variability in the small scale roughness patterns (i.e. ripples) at the tip of the Sand Engine. With the dynamic nature of the Sand Engine, we are working to provide insight into the forcing mechanisms of rapid small scale bathymetric change. To quantitatively measure the ripple change, we have two rotary pencil beam sonars with centimeter scale resolution, and to complement these acoustic sonar measurements, we have developed a laser grid and camera system to optically measure millimeter scale change in roughness. While, the sonar works very well in any level of water column turbidity, it has inaccuracies in resolution when the ripples get very small. At the same time, the optical measurements of the camera do not work well in very turbid water, but when bedforms are very small (generally corresponding to smaller wave forcing conditions and lower turbidity), the laster-camera system can make detailed observations. These complementary tools provide us with information about small scale morphologic change. Additionally, we are using a set of acoustic velocimeters and current profilers to attribute hydrodynamic forcing conditions to observed morphologic change. The first image below is from a sector scan of the pencil beam sonar, the color scale is of the intensity of signal return, where red indicates a high reflector (i.e. the sediment bed). At sweep distance of 0 m and Z distance of 0 m is the center of the sonar head. The sonar rotates by means of an azimuth drive in a circle to create a local 2D bathymetric map. This image was collected on October 6th, and clearly demonstrates the presence of peaky ripples. And, the following image is an example of the laser grid projected over a flat bed and a fish. In the presence of ripples, the grid bends over the ripple crests and through the ripple troughs (like it bends over the fish) so that ripple height, length, and direction can be determined. So far, at the Sand Engine, we have observed a very dynamic temporal variability in small scale roughness that, at first look, changes with the wave conditions. In the next few days we are looking forward to some big waves and wind, so we can see how these ripples change as the waves get larger!! We are very excited to be here in the Netherlands for the MegaPEX experiment! A great deal of thanks goes to the PADI Foundation for funding our investigation!